Miss Keane was born in Michigan and moved to London in 1907 to continue her career. 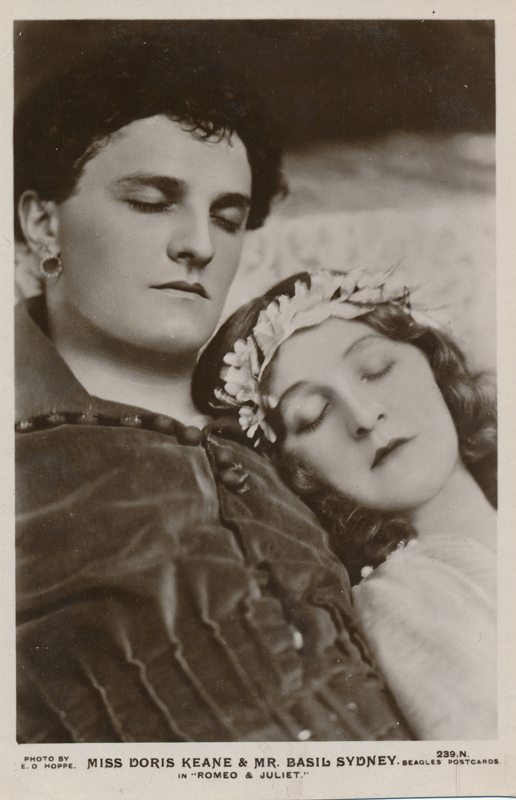 She acted a part in Shakespeare only once: she played Juliet in 1919 at the Lyric Theatre in London. The production was a good one with Dame Ellen Terry as the Nurse and Basil Sydney as Romeo; the play had a run of seventy-three performances, but Miss Keane had no need to depend on Shakespeare for a living and several smash hits kept her quite busy. She married Syndey in 1918, only to divorce in 1925. When Keane played Margherita Cavallini in Edward Sheldon’s play Romance, she was instantly elevated to stardom. When she took Romance to London in 1915, the play ran for an astounding 1,049 performances. The story is a fairly simple one. Thomas Armstrong (played by Owen Nares) is first the rector of St. Giles in New York. Forty years later, when he is Bishop, he looks back upon his love for the opera singer, Mme. Cavallini. The audiences seemed never to tire of this romantic play nor Miss Keane’s performance. It was revived in 1921, 1926, and 1927.